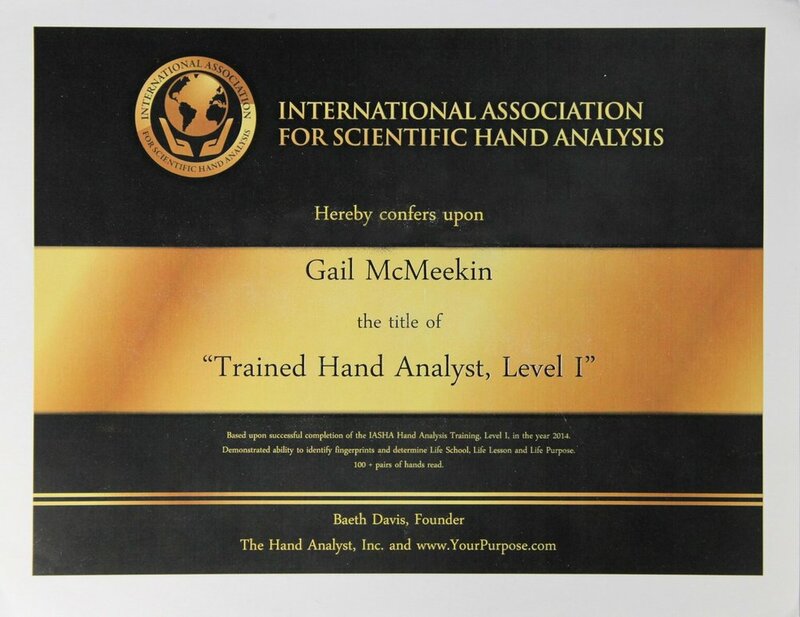 Despite my recent chaos, I did complete my certification in Scientific Hand Analysis, which took almost 5 years of traveling all over the U.S., taking lots of training classes, and reading 100+ hands to help people to discover their Life Purpose, their LIfe School, their Life Lessons, and their Gifts. Each time I read someone's hands, I am stunned by how accurate and life-changing this knowledge can be for young people and adults in all phases of life. The responses I get from people are amazing comments like, "Wow--this is such a relief to finally know who I am and what I am supposed to do to be happy," or "Now I understand why my life has not been working and you have given me the action steps to get onto the Master Path and transform it." I am working on some new classes, videos, and packages to help you to finally know the truth about who you are. In the meantime, I have two introductory packages that can get you started on a new path. You can also read the recent article in "Forbes" calling Scientific Hand Analysis the coaching tool of the 21st Century and listen to my radio interview on this science, hosted by Janet Conner of The Soul-Directed LIfe, about how it all works. I look forward to helping you create the life that was meant to be yours! My Life Purpose is Passionate Coach/Mentor/Leader with Heart in the Spotlight. What will yours be? Let's find out! Pretend you’re watching a movie featuring you in 2016. Do you see a new flair to your life? Have you added Juiciness to your relationships, work, family, or creativity? Have you added expansiveness and C O L O R to your life this year?